The Our Lady of the Abandoned Church also known as Nuestra Señora de los Desamparados is a Roman Catholic Church found in Marikina City. It was built by Augustinians in 1700 and it is still standing today as one of Marikina’s old churches despite being destroyed a couple times by 2 earthquakes in 1816 and 1830 and by fire in 1861. It is the home of one of the images of Mary which has received a Papal seal. The foundation of the Catholic Faith of the Marikeños was marked by the building of the Jesus de la Peña Chapel by the Jesuits. 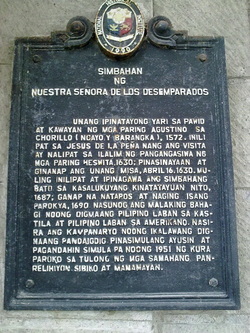 But upon the transferring of care of Marikina to the Augustinians by Governor Gabriel Cruz Elasque, he ordered the vacation and demolition of Chapel due to the flood caused by the Marikina River during rainy seasons and the inability of the Chapel to accommodate the increasing population of the area. The friars searched for higher ground for a bigger church where it is located today. The Image of Mary in this parish has plenty of miracles attributed to it. One of the remarkable miracles of the parish is the one during the World War II when the city was bombarded by the Japanese army. As it turns out, there was a bomb that landed near its bell tower that could have destroyed the whole church. Fortunately the bomb did not explode and they counted this incident as a miracle which was attributed to the intercession of the Blessed Virgin Mary.